In terms of countertops, granite has been the king for decades. However, new materials and colors are becoming more widely used and accepted as great choices not just in terms of looks, but as durability as well. Quartz countertops are an example of this kind of durable and unique material. 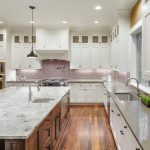 If you’re considering adding new countertops to your home, we have four reasons why you should consider quartz countertops. Durability. Quartz countertops are a manufactured material that mimics stone. Because it’s manmade, it has all the strength of stone with none of the imperfections of porous nature. That means it is strong and easy to clean. Greener Product. The manufacturing process of quartz countertops involves the grinding up and re-using leftover portions of stone with added colors and flecks of materials. The re-using of old materials and giving them new life can help you feel good about the purchase of your quartz countertops. Consistency. While granite countertops might vary in terms of color and size of the inclusions, quartz countertops are able to give you a consistent color and particle size each and every time. This means that the countertop you choose will be the same color as the sample that you looked at with no surprises. Variety. Quartz countertops come in a huge variety of colors — nearly anything that you can think of! Some styles are nearly identical to even the high-end of granite countertops and some colors would be perfectly at home in a contemporary city apartment. It just depends on your personal taste and style, but the variety means there is a quartz countertop color out there for you. For more information on quartz countertops, contact us here at The Granite Guy!